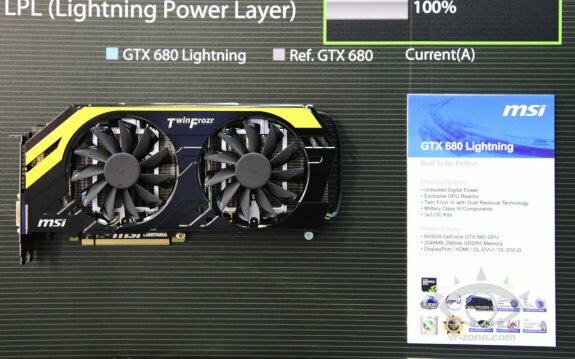 TPU has some extra details about MSI's upcoming GeForce GTX 680 Lightning graphics card. This model is anticipated to arrive within a couple of weeks. Based on the GeForce GTX 680, the card is expected to feature >10% higher out of the box clock speeds, with 2 GB of memory. Like its cousin from the red camp, it features MSI's swanky new black+yellow Twin Frozr IV cooling solution, and Unlocked Digital Power VRM, which gives users fine control over GPU, memory, and PLL (auxiliary) power domains using Afterburner software.